I hear this often, from my husband who loves the stuff (especially the ones with peanut butter in them), to my own neurotic self (especially during the holidays but almost always all year long), to my terrier dog (who doesn’t talk but must be asking this since she likes to go after the stray bits left on the kitchen floor). It can’t be argued though. 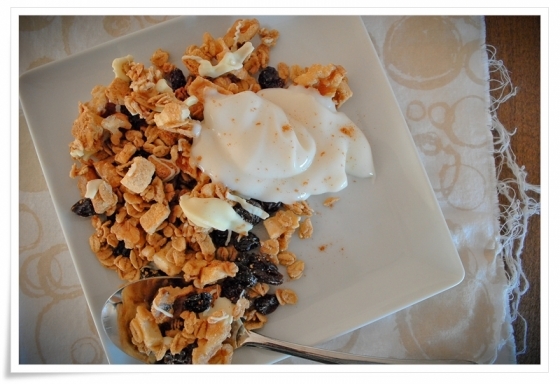 Homemade granola is one of life’s simple pleasures. Both in the act of eating and making. There’s something so intrinsically satisfying about making a batch of granola. With so many options for ingredients, the variety of granola recipes can be endless and are only limited by your imagination. I find this both liberating and challenging, feeling the rush of excitement of my own free will to choose how to make it and yet at the same time bearing the heavy cloak of countless possibilities. Each time I make granola it comes out a little different. Some days I opt to add dark chocolate chips. Other days I reach for the morsels of peanut butter that my husband adores. The types of sweeteners vary, from honey to dulce de leche to even just plain old sugar. So this time around was no different. Trust me when I say you’ll be knocking these back all week long: by the fistfuls, by the spoonfuls (with your milk, yogurt, ice cream?). These also make great homemade holiday gifts piled high inside pretty glass mason jars. But given how good these taste, chances are you won’t have any left to share. Preheat the oven to 325 degrees. Line a baking sheet with parchment paper or silicone mat. In a large bowl, mix together the rolled oats, salt, and cinnamon. Set aside. In a smaller bowl, whisk together the dark brown sugar, maple syrup, vanilla extract, and canola oil. Pour this mixture over the rolled oats and combine with a spoon. Toss in the chopped walnuts and white chocolate chips. Mix together with a spoon, spatula, or your hands (I did). Taste it! If it needs more sugar, salt, love, add it. Pour this sticky good mess onto the baking sheet and spread out. Put it in the oven and bake for about 20-25 minutes, tossing it halfway in between if you want it loose and crunchy (if you want it sticky and clustered — leave it and don’t touch), or until it smells really good and when you try a piece you love it. When it’s out of the oven, toss in the raisins and let the granola cool before drizzling over it a spoonful of sticky sweet melted white chocolate. Leave this be until the chocolate hardens before gathering the granola and storing into a glass container. This should last you for about a week out or for a couple weeks in the fridge. Now go. Be happy today. 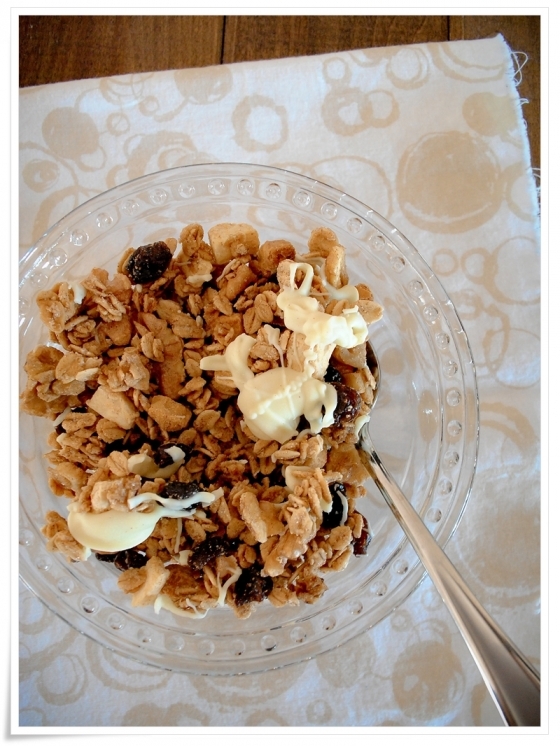 sarah - Oh I love making… and eating granola. This recipe sounds fantastic!! 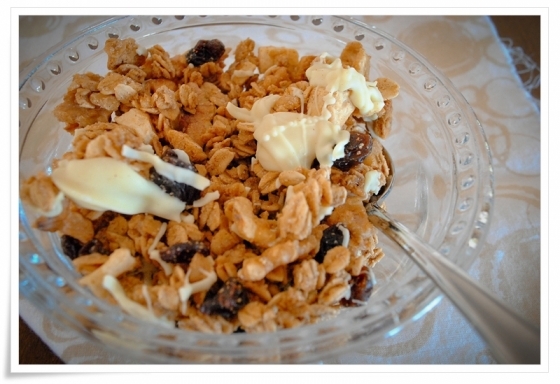 Fatpiginthemarket - Making granola has been on my list of things to try for awhile. Incorporating dulce de leche is now totally on my list! Fred @ Savorique - It’s a super filling and tasty breakfast recipe but I’ll use real dark chocolate chips instead of the white thing! Thanks for sharing!